This two-day workshop focuses on the fundamentals of lighting, camera functions, and composition used in the world of commercial photography. Whether it’s for a future career in portraiture or photojournalism, this workshop prepares you with the tools you need. You’ll hear from and work with professionals in their fields as they share their expertise in the lighting studio and on the streets. From getting the perfect shot to producing a finished image, you will enhance your shooting and editing skills to work like the pros! 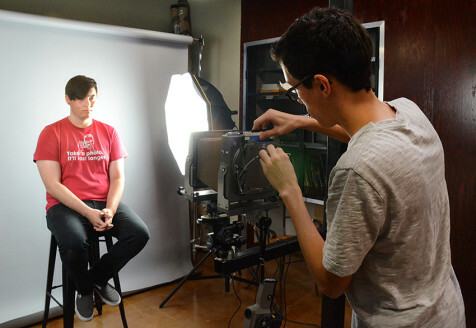 This camp is highly recommended for any student involved in yearbook or school news photography, those interested in taking portraits for events, friends, or family, and those pursuing a future career in commercial photography. Each student will leave with a digital portfolio of the work made during camp. Students should have a DSLR camera or digital camera with some manual functions. Box lunch provided. For the last couple of decades he has pursued long term documentary projects. His passion for image-making has evolved into exploring cultures seldom seen in mainstream society. David has amassed extensive images in the Greek Orthodox monastic community and in the punk rock music industry. Born and raised in the suburbs of Cleveland, Ohio, Neil became interested in photography during high school. Early work experience included summers as publicity photographer for Thistledown & Randall Racetracks. After completing a BFA in Photography at Ohio University, the US Navy offered photographic experience in the Atlantic Fleet Combat Camera Group. Assignments ranged from documenting NATO Exercises in the North Atlantic to earthquake assistance in the Peruvian Andes. Following the Navy and a move to Arizona, Neil’s career took him into television news gathering. A position he held at Channel 10 in Phoenix for 39 years. In the 1970’s Neil completed his MFA in Photography at Arizona State University and had the opportunity to participate in the Ansel Adams and Friends of Photography workshops. This offered the opportunity to study with Wynn Bullock, Gary Winogrand, Jerry Uelsmann, Fredrick Sommer, W. Eugene Smith along with Ansel Adams and other masters. Through the 1970’s & 1980’s Neil also taught photography in the College of Architecture at Arizona State University, Mesa Community College and video courses at Scottsdale Community College. Neil’s exhibition record includes his first show at the Phoenix Art Museum in 1973. Since then work has been exhibited at the Portland Museum of Art, ME; f22 Gallery, Santa Fe, NM; Modesto Jr. College, Modesto, CA; Virginia Intermont College, Bristol, VA; “Here is New York” Traveling exhibition, NYC; Friends of Photography – Members Exhibition, Carmel, CA; West Valley Art Museum, Surprise, AZ; Art Intersection, Gilbert, AZ; Central Arizona College, Casa Grande, AZ among others. Neil’s Photography credits include Camera Magazine, Lucerne, Switzerland; Harley-Davidson The Ultimate Machine, CLB Pub. Ltd., Surrey, England; No Brakes, by Lois Gould, Henry Holt and Co., NY,NY; Woman’s Day Magazine. Publishing credits include the book ‘Morgan Exploration’ published in 2009 which has received awards from the Arizona Book Awards 2010 Glyph winner and Independent Publisher Book Awards 2010 Bronze winner. Neil is presently on the board of InFocus at the Phoenix Art Museum, participates in photography lectures and workshops and is continuing work on creative photography projects.